It’s as globally widespread as water. It is an essential cog in the machine of our modern economy. There’s even a good chance you’re reading this article on a device created from it. It is plastic, and it is currently in the midst of a very global crisis. Earth Day 2018 takes place on April the 22nd, and aims to highlight the challenge created by growth in plastic waste around the world. Exploring the realms of procurement best practice around plastic use can help us play our part. Plastic is a versatile and practical material for a wide range of applications. In procurement practice we can use it in everything from packaging to an essential component of our final products. That versatility has led to an explosion in plastic use in recent decades. Plastic production has grown twenty-fold in just fifty years. As of 2014 we produced 311 million tonnes of plastic annually. The most notable problem with this rise comes in the world’s oceans. A staggering 8 million tonnes of plastic waste ends up in our oceans each year, and it’s causing significant harm to ocean ecosystems. There are currently five tonnes of plastic in our ocean for every one tonne of fish. With plastic production predicted to quadruple by 2050, that ratio is expected to reach 1:1 by the same year. Current estimates suggest that globally we recycle just 14% of plastic packaging we use. That not only creates an ecological burden, it frames an economic loss. A huge 95% of the value of plastic is lost after just one use. With developing new technologies it’s estimated that amounts to as much as a US$120 billion avoidable loss. A 2016 study revealed that Malaysia’s commercial recycling rate sits at just 11%, far below nations such as Germany which have achieved an admirable 50%. Peninsular Malaysia alone produced 2.5 million tonnes of plastic waste in 2010. While it’s impossible to separate the commercial contribution to that figure, it’s clear that procurement professionals can have a vital role in addressing the issue. 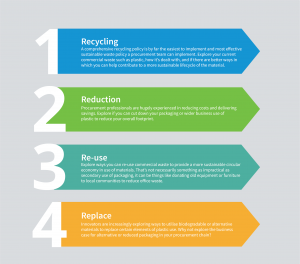 What is procurement best practice on plastic use? Ultimately our duty towards sustainable procurement practice isn’t just a moral responsibility, it can also help build a leaner, more efficient procurement operation. Whatever the path you take to achieve it, reducing plastic waste is an essential need for businesses around the world. It also presents another powerful opportunity for procurement teams to demonstrate the huge strategic benefits of comprehensive procurement oversight.